Taiwan is famous for its night markets scattered all over the country. Different cities have their own version of a night market, and Chiayi City is no exception. The Wenhua night market of Chiayi is frequented by tourists. They go here and look for interesting things to buy. However, people go here mostly to sample the delicious local treats. 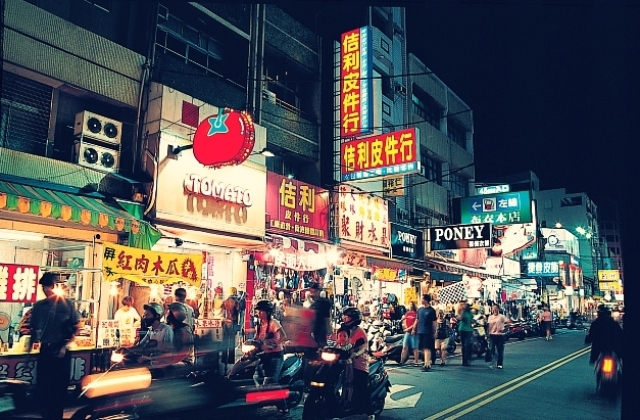 The night market, as its name suggests, is located along Wenhua Road. This is why it is also referred to as Wenhua Road night market. It is a permanent night market, which means it is open all year round. During the day, it functions as a road, but at night it is closed to traffic. The night market occupies a pedestrian area that stretches for about half a kilometer along the southern part of Wenhua Road, past the fountain. The stalls open at around 6 pm each day and stay open until late into the night. The place amazingly comes alive once the nighttime comes, and the action continues as the crowds get thicker a few hours afterward. Although it is ideally not the place to buy the best products of the city, the Wenhua night market is worth a visit. Shopping is not really the primary activity here but you can look around just to see the goods they are selling, which will give you a glimpse of the local culture. You will find some clothes, trinkets, bags, and other products that may interest you. After looking around, you can try the Wenhua Road night market and see what the place is famous for: food. Wenhua Road is lined with hawkers and vendors selling a variety of local foods and delicacies. The food is freshly cooked and is often served steaming hot, which is good because you can tell that it has been properly cooked. There are so many dishes to choose from, and many people make the mistake of trying to taste everything in one night. As a result, they end up not really having enjoyed what they have eaten, even though they have eaten a lot. When going to the night market, you must remember to be strategic in buying food. If you are staying in Chiayi City for a number of days and you can easily come back to Wenhua night market in the coming days, then try just a few dishes on your first visit. Also, try not to stuff yourself with the first food you buy. To make sure that you enjoy every bite and really taste the yummy delicacies, just eat a little of every dish you buy. Remember not to go to the night market with a full stomach or the entire visit will be pointless. Turkey rice is a must try in the Wenhua night market. It is Chiayi City’s most famous dish, which is made from rice topped with strips of turkey and drizzled with special sauce. Other dishes that you should try are glutinous rice sausage, noodles, and wanton. For dessert, you can try the flavored ice. This is made from smooth, finely shaved ice infused with different flavors like chocolate and mango. What’s the Weather in Chiayi?